Vegas and One Lovely BLOGiversary with a Giveaway! I feel like I haven't posted on my blog in forever!! Probably because I was in VEGAS!!!!!! EEEEEEK!!! What an AMAZING time I had! The theme for the conference was "Come Together, Go Further." They added "Give Back" which I love! *By the way...that picture I took doesn't even show the entire Venetian/Palazzo Hotel!! It was HUGE!! I seriously would have been lost every.single.day if my husband wasn't there to help me navigate around!! Here are the events and sessions I attended: *Wednesday - Blogger Meet-up This event was HUGE!! There were tons of people and lots of giveaways! I left the meet-up with tons of free stuff! *Thursday morning - PreK/Kindergarten Networking Hadar from Miss Kindergarten and Maria from Kinder Craze put a fun scavenger hunt (I wish I took a picture of it, but I was too busy meeting new people!) together for this that really helped you meet new people in a fun way. I met a lot of great people during this! *Thursday afternoon - TpT Welcome; Afternoon Sessions I went to Fix Your Brand and Take Your Store to the Next Level; Blogging Panel; and Design Panel. They were all amazing and offered a lot of valuable information! It was so neat to listen to bloggers that I follow! *Friday - TpT Speakers (Rachel Lynette was great! ); Sessions in AM and PM; TpT Happy Hour I attended Did I Really Sell That?! where Deanna Jump and Deedee Wills were so adorable together and really had some great advice for creating products! Rachel Lynette had some great advice, especially related to Pinterest, in TpT Marketing Do This, Not That. I learned about a great watermark app in TpT App Hacks. I won a flash drive in my last session, Write What They Need, with some great resources from Jessica from Ideas by Jivey! I met some of the most amazing, sweetest people ever while I was there! It was so nice to put a face to all of my blogging friends! These are just some of the people I took pictures with, but I met so many other people!! *Top Row: Maria from Kinder Craze, Deanna Jump from Mrs. Jump's Class, Deedee Wills from Mrs. Wills' Kindergarten *Middle Row: Hadar from Miss Kindergarten, GoNoodle!!! !, Amie from Glitter Meets Glue *Bottom Row: Chris from The Scoop in Second Grade, Laura from Luv My Kinders, Alex from The Kindergarten Connection, Suzanne from Kindergarten Planet, Becky from The Class Couple, and Greg from The Kindergarten Smorgasboard. I was so excited when I found Farley for my Vegas Currently! I literally stopped her as we were walking to the Conference! I thought it was her and then I saw her adorable tote-bag that said Farley on it and that confirmed it! I put Adventure for my All In because I felt like going to Vegas was an Adventure! One thing I did learn is don't be afraid to go up to people you recognize because they will be incredibly friendly! And I was able to accomplish my "wanting" section of my Vegas Currently when my husband and I made it to the Vegas sign!! I was sooooo excited to see this! Here is a picture of some of my free swag!!! So many generous companies donated! 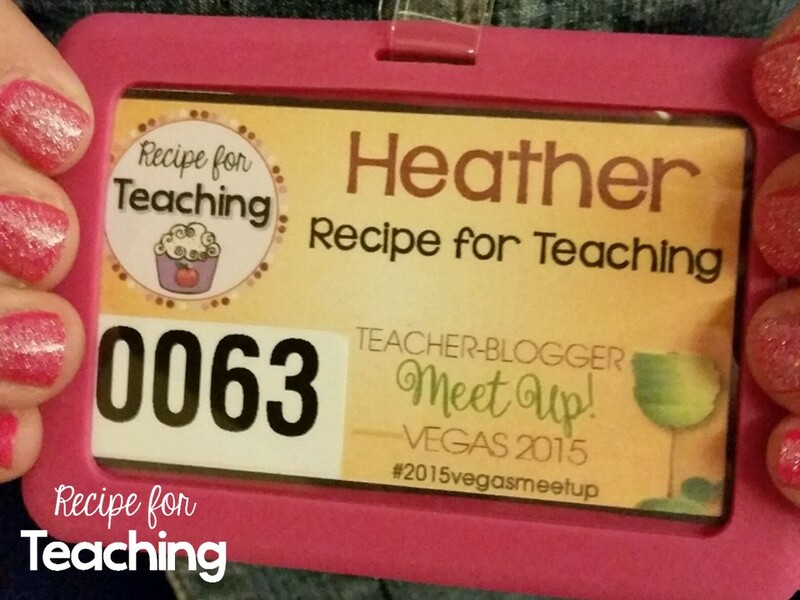 As someone who has only been blogging for one year, Vegas was an awesome opportunity and I learned a lot! I'm so glad that I went! Be sure to check out some other awesome Vegas posts over at The Elementary Entourage! Now for my BLOGIVERSARY!!!!!! Sunday, July 12, marked my one year anniversary of starting my blog! I've made many changes to this blog and I am thankful for the many connections and friends I have made through it! 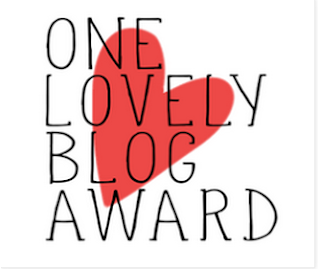 And speaking of connections and friends, Rachael from Sweet Sweet Primary actually nominated my blog for the One Lovely Blog Award! We were able to meet and sit next to each other in one of our conference sessions and she is just like her blog name - sweet as can be!!! I'm so glad I was able to meet her! For this award, you just share some fun facts about yourself! 1. I designed my blog myself! 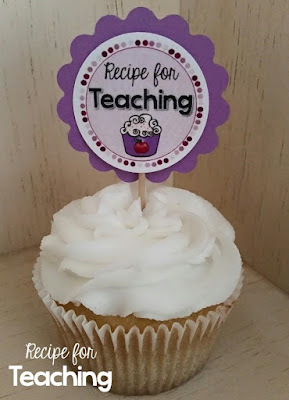 I have looked at so many different tutorials and made so many updates since starting my blog. It's fun to look back at where I started and how my style has changed. I actually just gave my blog some new updates! 2. I love to bake, but you probably already knew that if you follow me on Instagram or on my blog! 3. When I go on vacation, I love making an itinerary. This doesn't mean I will actually stick to what I have planned for each day, but I like to have done some research on what to do! My family still makes fun of me for the itinerary I made for our wedding, but it made the day run smoothly! 4. I pretty much stick to expiration dates on foods! 5. I want to go on a European Vacation! I think this would be so much fun! 6. I can play the piano and the flute. 7. I love a good Hallmark Channel Movie (the Christmas ones are the best!) and I even sometimes get together with friends to watch them! 8. I love mac and cheese which means I pretty much have a lot in common with the kindergarteners that I teach! That always seems to be their favorite food! 9. I love going to sports games, but mostly because I like "sporting" the accessories for that team - earrings, shirts/jerseys, necklaces, bracelets, hats, etc. 10. I love the holidays! I love spending time with family and friends during holidays! I love baking for the holidays! I love holiday movies! I love making photo booth props for holidays! I love shopping after holiday sales! #sorrynotsorryforoverusingexclamationpoints! Now that you have made it this far in this LOOOOONNNNNGGGG blog post, I'm doing a giveaway for my Blogiversary!!! 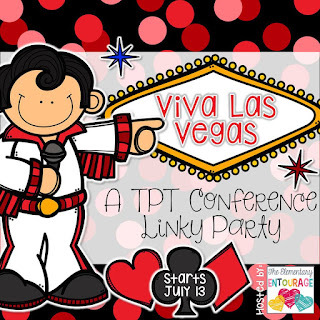 One lucky winner will win a $25 gift certificate to TpT! This will be perfect for your Back to School shopping on TpT! Just enter the Rafflecopter below for your chance to win! a Rafflecopter giveaway Good luck with the giveaway and thank you so much for following along with my blog adventures! !